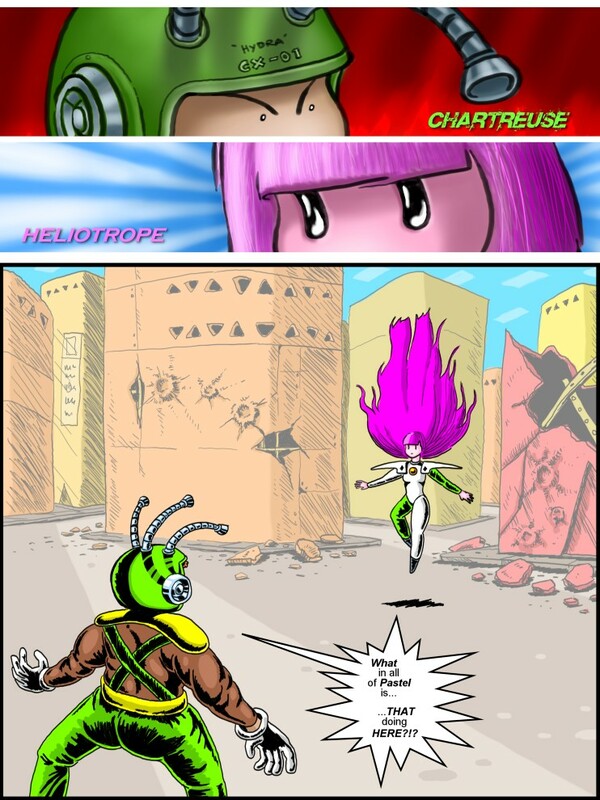 "What in all of Pastel is...."
PAGE FOOTNOTES: The battle between the superhero and the supervillian. Now when did that start? The ancient Greeks? Babylon? Before? A flying hero versus a fire-casting enemy? Devil or Angel? When Ragnarok calls, when Chronos has uppity children, when the Titans come down from the ice, when the snake demon threatens little Krsna's village, when Hanuman is ordered to help, when Hera is throwing a hissy fit or Enkidu is on the job... another superhero battle begins. Surely the oldest human story is 'I was here', usually painted with a hand around which is spit pigments onto the cave wall... but surely the second oldest human story is 'someone was a superman' -whether the fight was against a bison, another tribe, or strange gods. We tell this second oldest story over and over, eternally, it is at the base of everthing we watch, play, read or hope for in life. The superman could be a detective or a doctor or a scientist or a brawler, a farmer or sportsman or mother or space captain - but they are always larger than life, and always more than human, or at least more than expected, they have some power greater than average, and they accomplish that which impresses and amazes. The story is told in countless ways, but at it's heart it is always the same story; someone was super, someone fought a problem, a threat, a puzzle, but ultimately an enemy of sorts, a supervillian, and they win. We know they will win (if not immediately, perhaps after more training)...the suspense comes not from victory or loss, but from how the ancient tale will unfold this time, how the second oldest story will be made new once again.